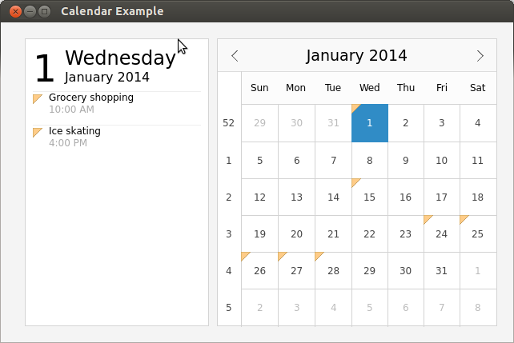 The Calendar example displays a Calendar control and an events list for the selected date. It uses a C++ class to fetch the event details from an SQLite database. The example app uses a custom CalendarStyle to highlight the selected date and mark the dates that have events. The C++ class, SqlEventModel, inherits SqlQueryModel to create a database with dummy events for certain dates. // We store the time as seconds because it's easier to query. In main.qml, the SqlEventModel custom type is used to get the list of events to mark the dates on the calendar. The app uses a Flow type to position the items, and manipulates the items' width and height based on the orientation change on mobile devices.